There was a certain irony in seeing James Farm, the new quartet spearheaded by acclaimed saxophonist Joshua Redman, at a club called Jazz Standard. During their hour-long set on June 16, no standards were played. Nor could “standard” be used to describe the band’s approach to its music. The most striking characteristics of James Farm’s performance were the group’s balance and tightness. Of the former, it’s difficult to think of another quartet whose members play so democratically. The drums, often relegated to the backbeat and occasional solo in the quartet setting, were at the forefront. 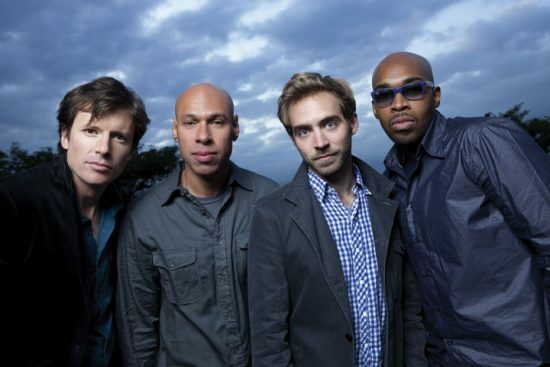 Eric Harland, a veteran drummer whose résumé boasts gigs with the likes of Kenny Garrett, Michael Brecker, Ravi Coltrane and Wynton Marsalis, gave the band an incessant drive. Unafraid of his cymbals and floor tom, Harland seamlessly melded rock and jazz beats in a way that could only be described as “anti-kitsch”; his effusive outbursts on the snare and introspective cymbal work on the quieter tunes stood out in the best of ways. The understated, almost hesitant piano of Aaron Parks mixed just the right level of melodic and harmonic blend to provide thoughtful tonal structure for each piece. He shared pedal points with bassist Matt Penman, whose lines outlined the chords sparsely, and whose impeccable timing, paired with Parks’ melodic intuition, created wondrous tension and release. As usual, Redman’s sonorous tenor soared, reaching a climax several times, most noticeably on “Chronos,” a Parks composition with which the set concluded. From the first downbeat to the last faded note, James Farm was tight to a virtuosic degree. This is what you’d expect from a professional group, but given the unconventional meters and complex forms of the pieces played, the quartet’s cohesiveness was especially impressive. There came a point at which one knew the musicians weren’t counting the time, but feeling it. Throughout the set, Parks, Penman and Harland created a deep foundation of grooves, through which Redman wove a tapestry of vaulting runs and emphatic sustained outbursts in the high register. In an interview on his recent release, Highway Rider (which featured Redman on the saxophones), the pianist Brad Mehldau remarked on the sensitivity of the saxophonist’s playing. Indeed, Redman’s music sense-his intuitive feel for time, melody, space and feel-is unparalleled among horn players today. As for the tunes themselves, each was an exploration of an idea considerably more diffuse than a defined head. While all of the songs featured a recurring melody, the melodies themselves were often extended forms, hinging on a give-and-take between Parks and Redman and embellished by the powerful percussive elements anchored by Harland and Penman. The most engaging was the set’s opener, “Coax,” a Penman composition that gripped and entranced with a simple, yet haunting and intense three-note pattern sustained throughout by Parks’ versatile left hand. The off-timing of Parks’ lines and Harland’s snare work created a powerful edginess, punctuated by the synchronization of the bass line with Redman’s powerful melody. An improvisational paradigm seemed to tie together the soloistic framework on all of the pieces: Parks propelled his introspective solos with a left hand that maintained a strong sense of the bass line and thematic melody, while his right hand crafted enchanting and fluid harmonic explorations. If there was any modesty to Parks’ solos, Redman’s improvisation-rhythmically and sonically imaginative and wildly exciting-more than made up for it, providing a sort of extended catharsis and propelling the group to higher levels. Modern jazz-that is, jazz that can’t quite be placed neatly into a defined category such as “bop” or “cool”-is most compelling when it is merely informed, and not limited by, its influences. For sure, some of James Farm’s sounds, lines and ideas have relatives in the world of recent jazz: the pairing of Harland’s energetic, fearless approach to his drumming and the straightforward sparseness of Penman’s baseline unisons are redolent of the drum/bass relationship featured between The Bad Plus’ Reid Anderson and Dave King; the concept of a repetitive melodic theme in Parks’ left hand smacks of the music featured on Brad Mehldau Trio’s House on Hill. But the music of James Farm is far from derivative; the members of the quartet have come up with a sound all their own. Though the form of the music is distinguishable, the sometimes banal head-solo-head form is notably absent: interludes, ranging dynamics, secondary themes and a flawless sense of fluidity and interplay give the group’s execution a robustness atypical of the quartet setting. Eschewing the strictures of “standard” jazz without contrived cheapness or irreverence toward the rich history of its predecessors, James Farm achieves a sound worth any jazz lover’s listen. TD Toronto Jazz Festival 2011: To Jazz or Not to Jazz?